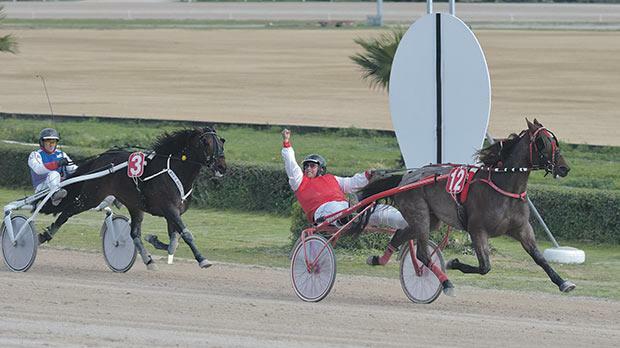 French trotter Quefi Des Caillons triumphed in the Assikura Championship final held at the Marsa racetrack yesterday. The Gold Class final was one of the most-awaited races during yesterday’s 11th meeting of the season that consisted of nine races, all for trotters. A Premier class race was also on schedule yesterday and the winner here was Ricardo Mols, driven by Philip Calleja. Nine horses lined up for the Assikura Championship final. It was Swedish Energitj (Carl Caruana) which stormed ahead in the initial stages, opening a small lead from Magic Broline (Clint Vassallo) and Lover Roc (Jesmond Attard). With a lap to go Energitj was still going strong, but around 300m from the finishing line was unable to keep up the pace and started to slow down. It was midway through the final straight when Energitj was overtaken by Quefi Des Caillons (Michael Ellul) and the latter secured its second win of the year from the two favourites, Power To Be (Noel Baldacchino) and Royal In (Marco Debono). After this final, Andrew Grech, on behalf of the sponsors, presented the winning trophy to Michael Ellul, and Kurt Scicluna, the driver and owner respectively of the winning horse. Quefi Des Caillons clocked an average time of 1.15.1” per kilometre. In the class Premier race, Danish Ricardo Mols, driven by one of its owners, Philip Calleja, dashed strongly from the outside around 400m from the end and took the lead in the final straight. Ricardo Mols chalked up its first win of the season and the second in Malta from French newcomer Ritz Du Bocage (Charlo’ Debono) and Retz Du Lys (Charlton Gauci). Smarty Jet (Marco Debono) followed behind in that order. Yesterday’s programme in-cluded also seven other trotting races reserved for horses coming from class Gold, Bronze and Copper. In the first class Gold race on the card, favourite Helacs Falo (Julian Farrugia) led all the way. This Swedish trotter was unchallenged during the mile distance and past the post first easily by three lengths from two mares, Carmen Sund (Noel Baldacchino) and Zizazimoko (Tony Demanuele). Turbulent (Shaun Portelli) finished fourth. For Helacs Falo this was its second win in a row. A keen duel between two trotters, Madam Di Poggio (Julian Farrugia) and Quoi De Neuf Ici (Redent Magro) developed in the final straight of the second class Gold race. It was the latter that obtained its first win in Malta after the photo-finish was consulted by the racing stewards. Original Blue (Jean Claude Pace) and Phenix De La Roque (Ronald James) ended respectively in third and fourth place. Another meeting at the Marsa Racetrack will be held on Saturday, starting at 1.30pm.